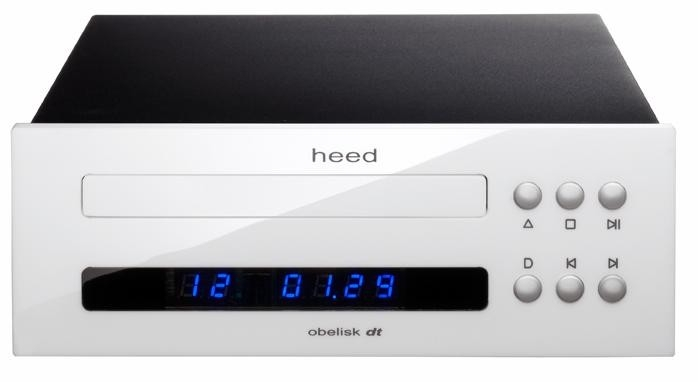 The Obelisk DT is a dedicated compact disc audio transport, reading both conventional and HDCDs, and outputting near-perfect digital data to any high quality Digital-to-Analogue processor. We designed the DT to be one of the best value-for-money optical disc players available. Its uncompromising technical approach, usually found only in prohibitively-priced transports, makes it well suited for partnering with a wide variety of DACs, from our keenly priced Dactil 1.2 DAC module (as used optionally in many Heed components: Obelisk Si, Obelisk PRE, Dactilus) up to more high-end devices such as our Obelisk DA, the DT's ideal partner. In an audio market comprised of DACs-galore with dedicated transports thin-on-the-ground, it is understandable how one might be skeptical of the significance of CD audio transports, and convinced that D-to-A conversion alone is responsible for superior digital performance. This misconception can lead customers to spend huge amounts on DACs for use with modest CD players as transports, akin to buying very expensive and demanding cartridges for mediocre turntables. The reality, however, remains inescapable: best data retrieval and transfer from the source are essential for best possible D-to-A conversion. Of course, we strongly suggest a serious audition to hear what this exceptional transport is capable of. If you are a discerning music lover on the lookout for a truly musical player, even by the highest analogue standards, the Obelisk DT may well be your ultimate CD-playing device.